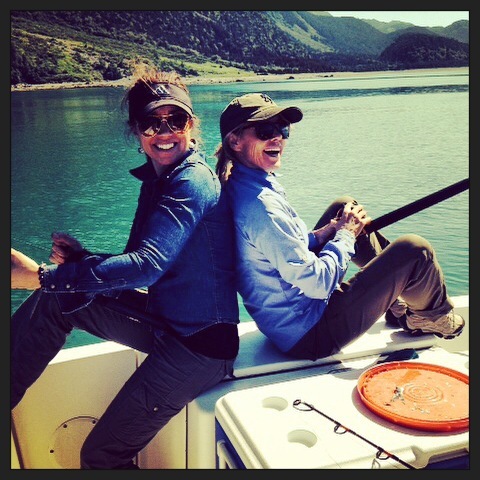 Here is a pic of my buddy and me fishing on a particularly sunny summer day in Haines. Fileted the fish we caught, washed our hands and then headed directly into town for drinks with our husbands. Haines is Heaven on Earth! Don't bother packing those high heels and wingtips to come here. Haines is a relaxed, casual place where people will spend a whole day hiking and walk right into the local restaurants and bars afterward. It's about sharing ideas and experiences. If locals ask about your shoes, it's usually to know if they are comfortable. Dress for weather but pack light. You don't need much. Bring a waterproof jacket with a hood, comfortable pants, a vest or fleece jacket for layering, a hat or beanie, hiking shoes, warm socks, and a lightweight down jacket. Snow conditions obviously require more warmth, so plan to add gloves, warm hat, heavier jacket, boots, scarf, thermals if you like for another layer of warmth outdoors. A backpack is a good idea for toting your things. Not too many purses or briefcases around here. This is a quick summary for the casual guest visiting Haines. Clearly, guests would have to plan their gear based on their activities (like fishing, rafting, skiing). Come, relax, breathe and ENJOY!